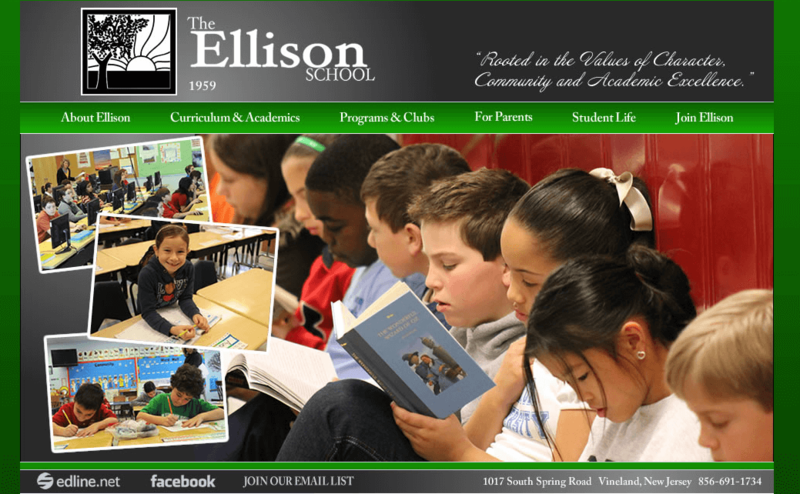 Our NJ web design team has given the Ellison School, a client of ours since 2006, a complete overhaul and redesign of their website. The first noticeable thing you might see is the slide show powered by jQuery technologies. The slideshow will be showcasing the students and faculty doing various activities around the school. Because its jQuery and not Flash, its completely iPad and iPhone compatible. You also might notice that it takes no time at all to load the initial webpage with the slideshow. Another big improvement over the old website is the improved accessibility for parents and students through a straightforward and painless navigation system. While it doesn’t look like it, the entire site is a custom WordPress website; making it easy for the client to maintain and perform updates. We have installed an onsite Google language translation system that contains up to 35 languages. The primary colors of the website are green, white, and black, which contrasts and blends flawlessly to ensure that readers can read the web content easily and navigate the custom WordPress website to locate the information that they seek. We used the WordPress platform for the foundation of the Ellison School website, but instead of using a pre-made design, we custom-designed the layout to give it the most visual impact possible. Very few NJ web design firms have the ability to use the WordPress platform with a truly custom front end web design; most just use WordPress design templates. Photo Gallery Built-In to the Website. Completely Managed by the website team at their NJ School. 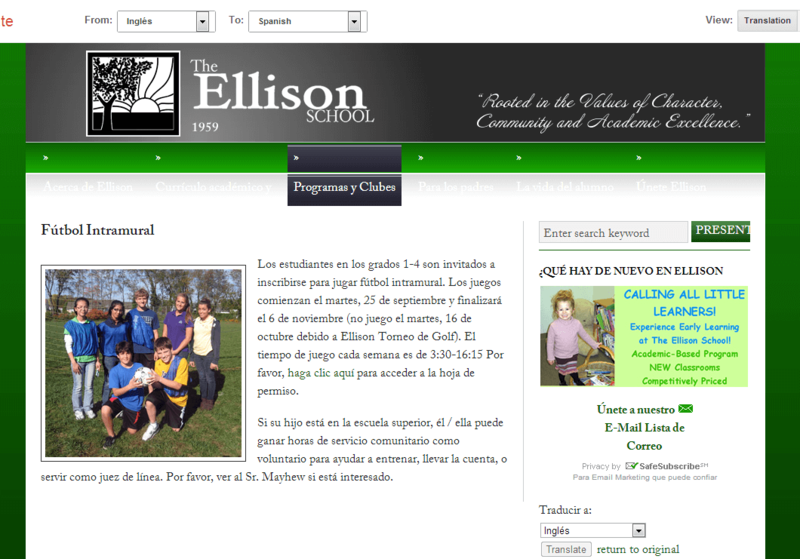 Because EllisonSchool.org is built on WordPress, it has a fully capable CMS (Content Management System) that enables the client to update content with ease. The CMS platform allows the client to edit and manage website content (such as photos, announcements, videos, and downloadable forms) through a login to the backend administrative system. The client managed website can be accessed from anywhere at any time, provided the computer has a stable internet connection, and make changes. The WordPress CMS platform is a cost-effective and efficient solution to adding website content without using risky proprietary software. We decided that the WordPress CMS platform was the best approach for meeting Ellison School’s needs because they are constantly updating the information on the site and because of its ease in use. 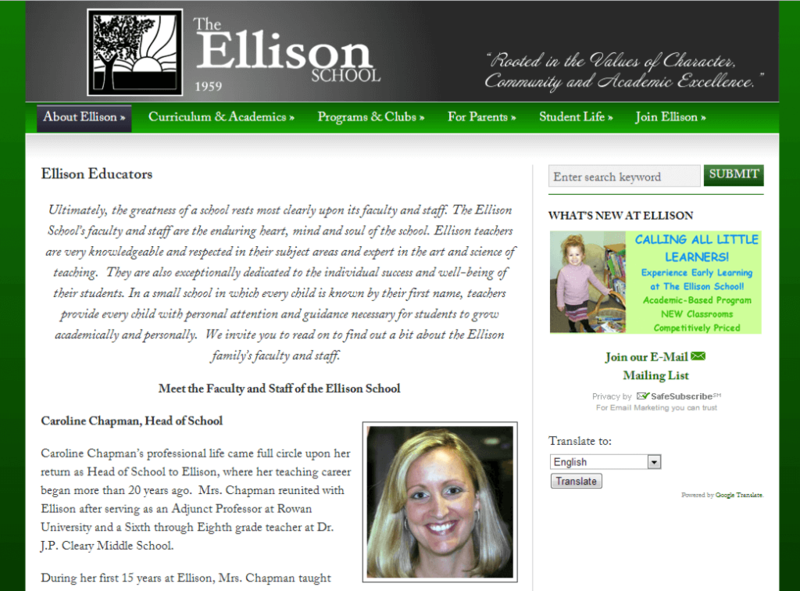 Sample Inside Web Page for Ellison School, Vineland, New Jersey. This page is updated using WordPress. Another great benefit of using a custom WordPress website are the SEO (Search Engine Optimization) plugins and accessibility. SEO plugins give the client extensive capabilities and options in optimizing their school website on a whim. By their very nature, WordPress websites are generally much more search engine friendly than your average HTML websites. Web Page Showing the Page Translated Into Spanish.